When you visit Nagoya, the largest city in the Ch?bu (central) region of Japan, there are many unique “Nagoya Foods” (Nagoya-meshi ?????) that you’ll need to experience. I’ll be sharing a series of food recipes that originated from Nagoya on Just One Cookbook and the first one is Tenmusu (???). Besides the recipe, I’ll also be sharing travel posts about our trip to Nagoya so don’t miss them (Part 1 here)! Tenmusu (???) 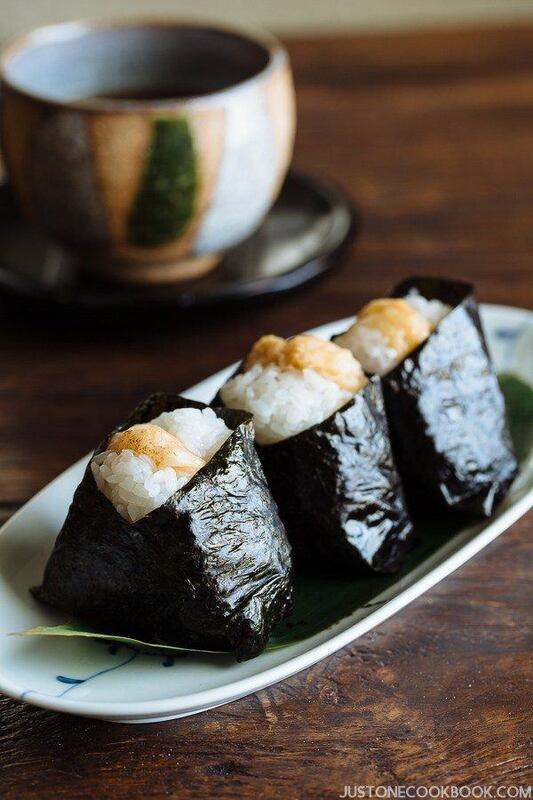 are rice balls with shrimp tempura as a filling, wrapped with nori (seaweed). It has a distinctive look as it shows the part of shrimp tempura exposed at the top of the rice ball. The word “Tenmusu” comes from two words combining – Tempura (???) and Omusubi (????) – which means rice ball in Japanese. Japanese likes to shorten names by picking the first few syllable of the words; hence, we end up with Ten(pura) + (o)musu(bi). I assume many of you are already familiar with Onigiri (recipe here) filled with pickled plum (Umeboshi), bonito flakes with soy sauce (Okaka), salted salmon (Sha-ke), and seasoned seaweed (Kombu) such as the ones in the image below.